About Perfect Video Day Productions.. Perfect Day Productions has over 20 years experience in the Wedding Videos sector, with the focus on providing a very high quality service to clients throughout the UK. All staff are qualified to degree level in media production. Perfect Video Day Productions is located in Norwich, Norfolk. Covering the whole of the UK and beyond. As the main Cameraman, Editor and Director of Perfect Video Day, It’s my responsibility to ensure all work is carried out to an exceptional standard. We pride ourselves on providing a top quality service to all our customers. 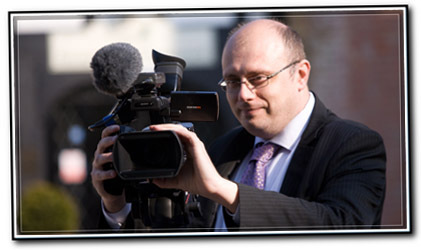 When not making wedding videos, I work full time as a successful Freelance cameraman and editor and have worked for the BBC, Channels 4 and 5. I also produce a lot of high end commercial videos for company’s such as Aviva Insurance, NHS, MacMillan Cancer Support and many more in the UK and abroad. Contact us if you would like a DVD of our high quality wedding video examples. Areas covered by our wedding video services.. Covering all of East Anglia. Areas including Norfolk, Suffolk, Cambridgeshire, Essex, Lincolnshire, Hertfordshire, Norwich, Gt Yarmouth, Lowestoft, Bury St Edmunds, Cambridge, Kings Lynn, Newmarket, London and the rest of UK. For wedding videos abroad prices will vary, contact us for more details.